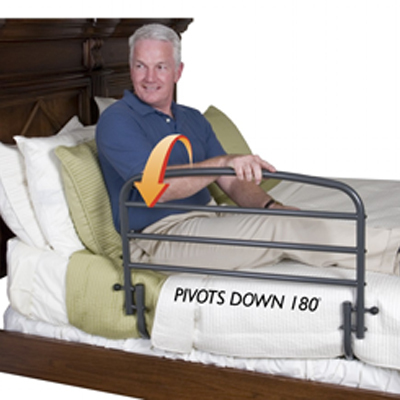 The Safety Bed Rail supports you when getting into and out of bed and also prevents you from falling out of bed. It easily folds down so it is out of the way when not in use. The Safety Bed Rail supports you when getting into and out of bed and also prevents you from falling out of bed. It easily folds down so it is out of the way when not in use. It attaches to any size home or hospital bed and is simply secured under your mattress.